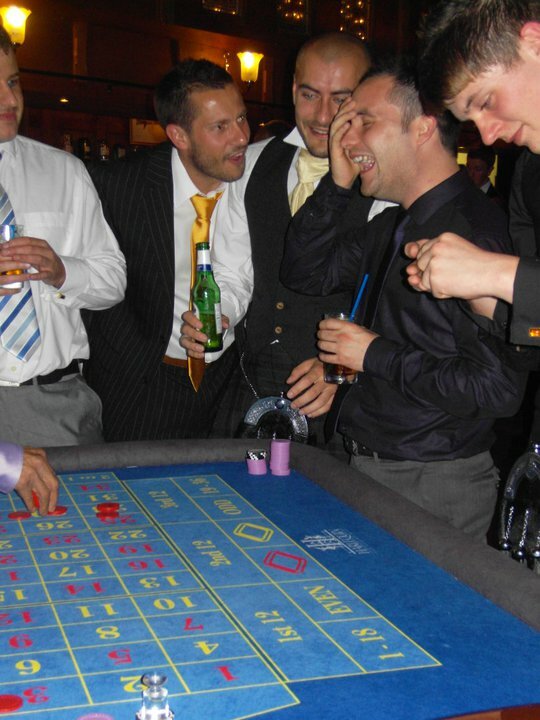 If you’re thinking about hiring a casino table for a party or event, the Roulette table could be just the game you’re looking for. Fun, fast-paced and very easy to learn, it’s one of our most popular games for parties, weddings and functions. The appeal of the game is timeless, and there’s something about the sophisticated and mysterious allure of the casino that always keeps people coming back for more! Roulette is really exciting and can be played by everyone, young and old. We’ll teach all your guests how to play, even if they’ve never played before, and it’s so simple, we’ll have everyone playing like pro’s in no time at all. Roulette might look like a complex game when viewed from a distance do to the large amount of numbers and different sections of the board which is more often than not, covered in hundreds of brightly coloured chips, but once the game is explained to you, it becomes very easy to follow and all to easy to play! It’s a simple game of “Guess Where the Ball Will Land”. 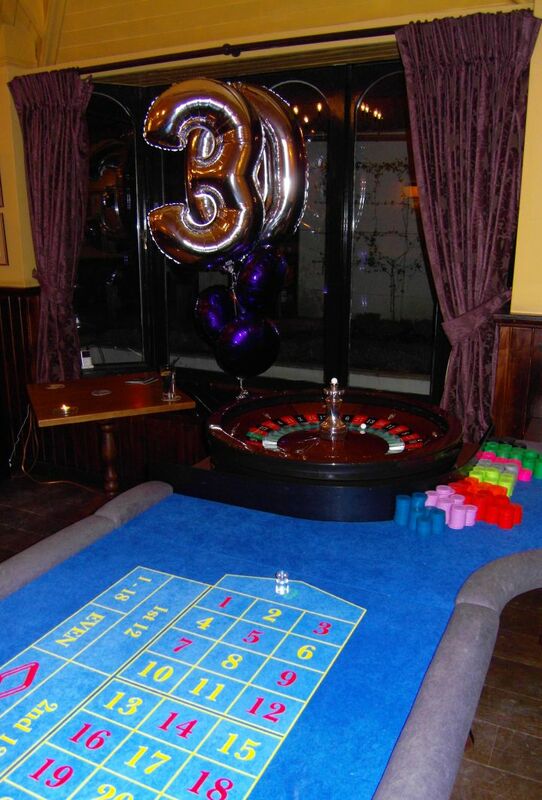 We have beautiful and luxurious, full size Roulette tables to hire for any occasion. Everybody loves Roulette, and it’s easy to see why. It’s fun, fast and easy to play, and it captures the attention of all ages and sexes, and even young children who seem to be attracted to the giant Roulette wheel and the fast spinning Roulette ball. Our Roulette tables are full size, exactly the same dimensions as the Roulette tables you’d find in any professional Las Vegas casino. They are just over 9 foot in length and each table is equipped with a beautifully hand-crafted Mahogany and Rosewood Roulette Wheel, which is also full size, a whopping 80cm in diameter (just over 2 feet wide). We buy most of our Roulette accessories from a store in Downtown Las Vegas, many of which have been used on the Roulette tables in the biggest and most famous casinos on the Las Vegas strip. At Harlequin Fun Casino, our croupiers are happy to teach everybody how to play Roulette even if they’ve never played before. The basic rules can be taught and learned in about 60 seconds, and it doesn’t matter how many times we have to explain the rules, nobody will ever feel like they can’t ask questions or quiz our croupiers on the finer points of the game. 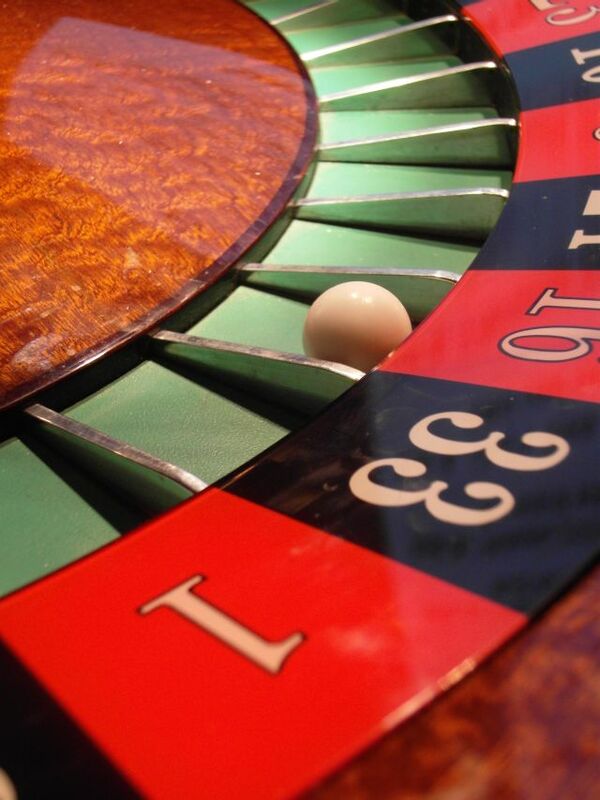 Roulette is a game played against the ‘house’ (the house being the Casino, also represented by the croupier.) All you have to do is guess where you think the Roulette ball will land once the croupier has spun it around the Roulette wheel. For example, if you think that the ball will land on number 5, place a chip on the number 5 on the board. The croupier will spin the wheel. If the ball lands in the pocket that says 5, you’ll win 35-1, which means that for every chip you put on the number 5, you’ll get 35 back! That’s the best result you can get at the Roulette table. The board is split into sections. The red and black numbers from 0-36 are called “Inside Bets” and the columns outside of the numbers are called “Outside Bets”. As the odds of winning by guessing the number exactly aren’t very likely (there are 37 different numbers on a Roulette Wheel) you can spread your bet a bit further and place you chip over two numbers by placing it on the line between two numbers. This is called a ‘split-bet’. Now, when the croupier spins the wheel, if it lands on a 4 or 5, you’ll win, but you’ll only win 17-1 which is just less than half the money you’d get for a single number bet. But the benefit of doing this is that you’ve got double the chance of guessing the number right. If covering two numbers with your chip isn’t enough for you, you can even cover three numbers with a single chip. This is known as a ‘street-bet’ and covers all three numbers in the row. Now, if any of the three numbers you’ve covered come in, you’ll get paid 11-1. Not as much as you’d get if you’d only covered two numbers with your chip. But again, you’ve given yourself more of a chance of guessing correctly. You can also place a chip over four different numbers, by placing it on the cross in between the four numbers you’d like. This is known as a ‘quad-bet’ If you put a chip here and any of the four numbers come up on the wheel spin, you’ll get paid 8-1. Not too shabby! If you want to spread your bet even further, you can cover six numbers with your chip, by placing a chip at the edge of the number board covering a rectangle of six numbers. Now, if any of these six numbers comes up after the wheel is spun, you’ll get paid 5-1. If you don’t want to play the inside bets, you can also play in the column outside of the numbers. Here, you can guess whether the number will be even or odd, high or low, red or black. Basically, it’s a 50-50 bet. If you think it’s going to be a red number that comes up, place a chip on the word “RED” (sometimes, the word is represented by a diamond shape in the colour red.) If the number comes up red, the croupier will double whatever you’ve put down on the red box. (If you’ve placed three chips on red, you’ll get three more chips back.) Obviously, if it came up black, you’d lose everything you’d put down on red. This is exactly the same for even and odd, low and high. The board is also split into thirds. The 1st 12 numbers, (from 1-12) the 2nd 12 numbers, (from 13-24) and the 3rd 12 numbers (from 25-36). If you put a chip in the box that says “1st 12”, you’re covering all of the first 12 numbers, so if any number between 1-12comes up, you’ll get paid 2-1, meaning for every chip you’ve got in the box, you’ll get two back. A bet on the outside 12 (thirds), pays 2 to 1. A bet on the outside even money bets (red or black, even or odd, low or high), pays 1 to 1.